South Gyeongsang Province Gov. Kim Kyoung-soo, on trial for his alleged role in rigging online comments to benefit then-presidential candidate Moon Jae-in, has been released on bail after 77 days in detention. The Seoul High Court approved Kim’s request for bail on the condition that he is limited to staying at his residence in Changwon, South Gyeongsang Province. 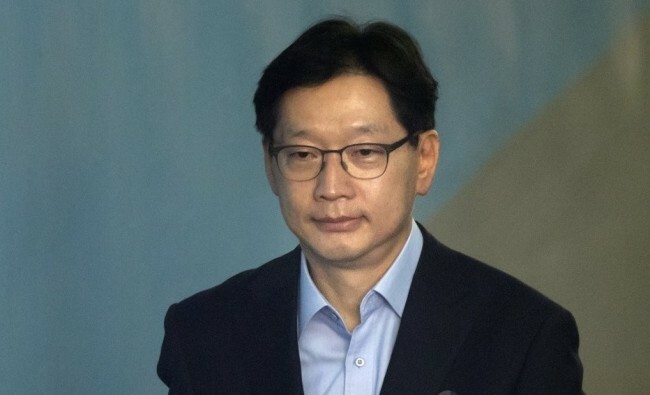 The court allowed Kim, who won his post in 2018, to commute to work, but ordered him not to contact anyone in connection with the ongoing trial. Upon his release, Kim apologized for being absent in the running of the provincial government and promised to do his best in the remaining court proceedings to set straight the truth “overturned” by the lower court’s ruling. “I will uncover the truth at the appeals court,” he said after stepping out of Seoul Detention Center in Uiwang, Gyeonggi Province. The bail was set at 200 million won ($176,515), with Kim required to pay half of the amount in cash. Kim, a close associate of President Moon Jae-in, was sentenced to two years in prison in January for colluding with power blogger Kim Dong-won, known as Druking, to conduct an illicit cyber operation aimed at swaying public opinion in favor of the then-opposition Democratic Party and its presidential candidate Moon ahead of the 2017 presidential election. Separately, Kim was sentenced to 10 months, suspended for two years, for violating the election law. The court acknowledged that he had approved the blogger’s use of an automated computer program to manipulate online comments on political news articles and was regularly briefed on the list of the articles. In return, Kim is alleged to have attempted to get an associate of Druking appointed consul general in Japan. Kim has denied the allegations, saying he was unaware of Druking’s opinion-rigging or the computer program. The blogger was sentenced to three years and six months in prison for carrying out the illicit cyber activities and for offering bribes to a lawmaker. He was accused of manipulating some 1.1 million comments on 76,000 news articles on internet portal sites between December 2016 and February 2018 to help the Democratic Party and Moon. Moon won the snap election in May 2017 after his predecessor Park Geun-hye was removed from power in March 2017 over a corruption scandal. Rival political parties showed mixed reaction to the court decision.